Emma Bonino Presidente was the list in support of Emma Bonino, the defeated presidential candidate for the regional elections in Lazio, 2010. 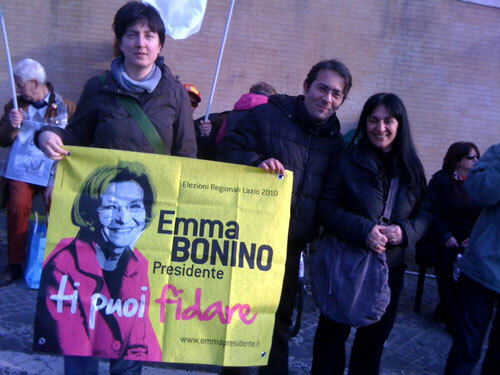 Bonino was supported by the center-left parties, in particular PD, IdV, SEL and her own Radicali. The "Emma Bonino Presidente" list was running for the majoritarian part of the elections and got only Bonino herself elected, due to the electoral law. 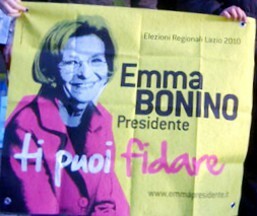 The flag was yellow, showed the list name and URL and a large effigy of Bonino, overall her campaign slogan "ti puoi fidare" (one can trust you) .